Thanks so much for your review. It made my evening! I would let my sons (9 & 12) use the gc to purchase ebooks for themselves. Just purchased Noahzark ebook to start reading to approve for my oldest son. This book sounds like just the thing for my astronomy crazed boys! We need some new reading materiel for our homeschool - Adventures in Odyssey and Billy and Blaze are high on the list, too. I'd spend it on music for my iPod, and my kids iPad! I visited the author's site! Great review. Sounds like a book that would keep kids interested from start to finish. The $50 gift card would most likely be used to buy books for my kids! $50 would buy some nice gluten-free foods. My health requires it. I would buy stuff for my trip to Mexico for Spring break! I'd love to buy my daughter a lamp for her room so she can read before going to sleep. If I were to win the gift card I would use it to buy gifts for y sons birthday next month! I would give the Amazon card to my fiance; he has been looking for a great book to read! I checked out the website--Mr. Pease has some great ideas! Oh my, there are so many things I could get with $50 to Amazon. First on my list would be to finish buying the Warriors series for my oldest daughter. I would put the giftcard toward the tv console I'm saving up for! I visited the website. I'll be looking out for the sequel also! I read that Noah will have to make the right choice to save his loved ones. My nephew might like this book. Sounds like fun and he seems like the perfect age group. Good review and great giveaway. Thanks. I would probably put the gift card towards a wifi router since mine just died. I went to the authors website and learned I can read a part of the book before buying. Pretty neat because that is how I do it at book stores. This $50 would be put straight to use in gathering goodies for my wedding in May! I would put the $50 toward a new camcorder! I have 2 books I reviewed on my website, www.boystobooks.com that I gave away and now I regret doing so. With my Amazon card, I would order a copy of both books for my son. I would use the gift card towards a new blu ray player I've had my eye on! I would use the gift card to buy myself a new coffee maker. I would probably use the gift card to buy more books! We are moving and I would love to be able to buy stuff we need for the kitchen- some pans and utensils! I would use it to buy myself some gifts:) My birthday is coming up so it would be nice to buy some new books! Thanks for this giveaway! I would buy the Dr Seuss collection for my lite boy! I learned that the time traveler is 12 years old. I would probably buy towels...I need new towels. I would buy a new pair of slippers and my husband some new books for Valentine's day. I would use it to buy something for my daughter's birthday. I'd buy my boys a Lego set they've been wanting. I went to D. Robert Pease's website. We are always buying something on Amazon so it would get spent quickly. I'd probably buy some homeschool books with it. I checked out the author's website and loved his work! I'm excited because I think both of my kiddos will love his books. We are always on the look out for great books! I would buy books with the Amazon gift card. I would buy some birthday gifts! I google + this post! 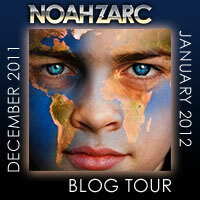 I visited the authors website and found that he is releasing the sequel - He's also finishing up a sequel, due out in 2012, called Noah Zarc: Cataclysm. I visited the author's web site and learned he has a blog. Well might sound odd but I would buy diapers,I need them. I visited the author's website and see that he's in the editing process for the sequel; we love a series around here! Cool website design BTW. Thanks! Hi, if I won I'd probably buy The Hunger Games trilogy. I 1+ this post (as Madeline Brubaker). Sounds like a wonderful book and a great giveaway!! I would probably use it to buy a game the family has been wanting to get. visited site and the Joey Cola - The Stoat of Many Colors would be a great read for the kids! I got an e-reader for Christmas, so I'd love to use the $50 GC on e-books! (They are a God send on my long train commute everyday to and from work!!) Thanks for the giveaway!! +1 this post (Mandy Kauffman). I would use the 50.00 card for more books! I LOVE books! I would use the gift card to get some books I have been eying (just for me this time). I would use the $50 to buy my son a few toys, just cuz I love him! I would buy a nespresso on Amazon. I visited the author's website. I like how he lists his works in progress and what he is reading. I think my kids would love this book. Thanks for the review! As for what I would do with the gift card? Buy books, of course! :-) Thanks for the chance. My son would love this! Thanks for the review! I would use it to buy my husband a gift for valentine's day or give it to him so he buy what he wants as a v-day gift from me to him! I Goggle +1'd as Priscilla Benavides. I would buy a whole slew of books for my kindle. Love to read. I'd buy my daughter some books to help build up her collection and I'd probably get a wooden toy or two that I've had my eye on for her!